The perfect choice for businesses who are looking to appear local to any customer around the globe. 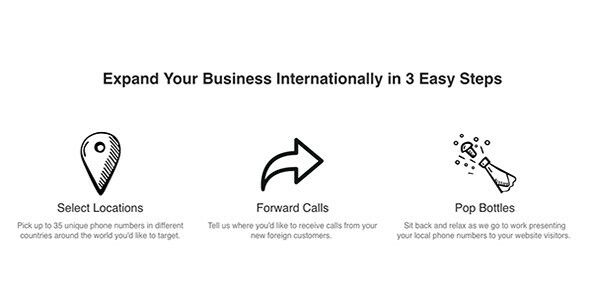 It’s hard to find a better offer than free calls for local and international numbers. Take some time to think about the kind of business you are running. Here are some questions to ask yourself. Do you frequently interact with customers globally? Would you benefit from having a local number to your customers? Do you rely on customer engagement via telephone? If you answered yes to these questions, then the value for money for a service such as ZenPhone can’t be questioned. While the plans are expensive if they are compared to other traditional VoIP services, the USP here is the local number and business generated as a result. However, for a smaller business who does not rely on phone contact worldwide, this might not be the right choice. Remember, all plans include a 14 day money back guarantee, which is well worth the trial. Take a look at the three plans on offer here at ZenPhone. They should give a strong idea of the amount of scalability the product has. The basic plan starts with 2 numbers, 100 minutes and a 50c cost per minute overage. This can be scaled up to as much as 10 numbers, 1000 minutes, and a 20c cost per minute if you go over this. This is a wide level of scalability, making it a great choice for medium-large businesses alike. You can’t scale upwards using your existing plan. If a business needed additional minutes or numbers, their options would simply be to move to the next pay bracket. However, it’s great to see that businesses will never be cut off, rather pay the overage fees for any minutes exceeding their plan. There are three steps for setting up ZenPhone, and this can all be done within a few minutes, even if customers are not particularly tech savvy. Firstly, select the locations, choosing as many as 35 numbers from around the globe. Next, choose the number where the calls will automatically forward to. (This is your current business number) Lastly, businesses will need to add a small piece of code to their website. Although this is fairly simple, if customers do not handle their own website, they might need to get help with this part of the process. 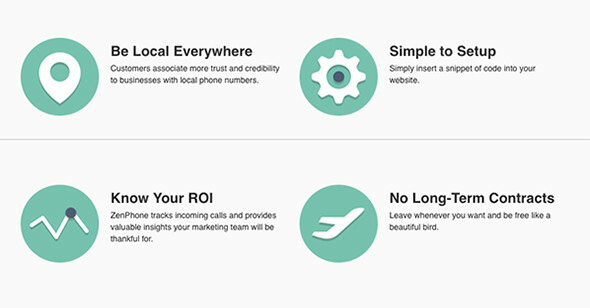 Now when visitors arrive on your website, a local number will be shown for them to call you. We would love to see a plugin offered which automatically enters the website code, making this process even simpler for businesses to get started with. ZenPhone announce loud and proud, “we love our customers!” The company is US based, so the hours of customer support might be slightly unusual if businesses are based in the UK. The hours are Monday to Friday 9am-5pm MST, which is 7 hours behind GMT, so 4pm to Midnight. However, customers can also email the company at any time, or reach out via Facebook which has a quick response rate, too. It would be amazing to see ZenPhone offer some video tutorials, a FAQ section or a knowledgebase with the most commonly asked queries included. As it stands, the site isn’t great for troubleshooting. Because ZenPhone is web-based, customers can access their account from anywhere with mobile data or a WiFi connection. This means you can make adjustments to your account settings, contact numbers, or marketing campaigns at any time. Customers will be able to review their analytics and see where and when the calls are coming in whenever they choose as well. This makes the software great for on the road campaigns or industries which involve businesses on the move. ZenPhone currently does not offer a mobile app for iOS or Android, and relies on mobile browser for customers who want to check in on the go. As the company offers management of more than 30 numbers and markets itself towards larger businesses, it would be great to see a mobile app in the near future. This would make the mobility of the service a lot more seamless. We’d love to see some more troubleshooting or self-service options on the website, as well as a mobile app in the future to help make using ZenPhone on the go just a touch simpler. With this in mind, if having a local presence is invaluable to your business, there isn’t a smarter choice than ZenPhone. 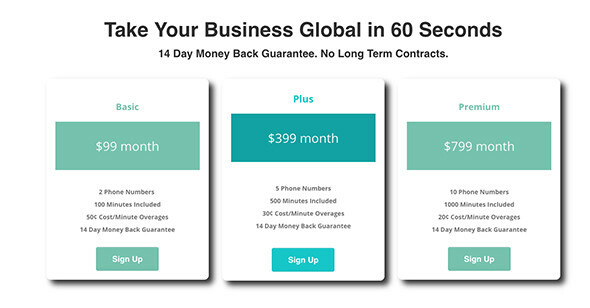 The best elements include the money back guarantee, the valuable insights found with analytics, and the credibility your business receives from a worldwide presence in up to 35 countries worldwide.